When I started smoking meat 25 years ago, no one knew of reverse searing. Today, you can hardly browse barbecue websites without being urged to try it. The process turns the traditional method of cooking a steak or roast—hot sear followed by slow roast—on its head. You start by smoking the meat low and slow to an internal temperature of about 100 degrees, then you char it over a hot fire to raise it to the desired temperature, applying the crisp smoky crust at the end. Reverse searing has several advantages: better heat control, as you can cook the steak to a precise degree of doneness. The meat cooks more evenly, too: no more “bulls-eye” effect—the dark crust with grey-brown ring of meat just beneath it, fading to pink, with the reddish-blue core characteristic of a really thick steak grilled over a really hot fire. Reverse searing gives you a consistent doneness and color from the top crust to the bottom. And because you rest the meat between low heat smoking and high heat searing, you can serve it hot off the grill. Best of all, it enables you to smoke the one cut of beef most people would never dare cook in a smoker. 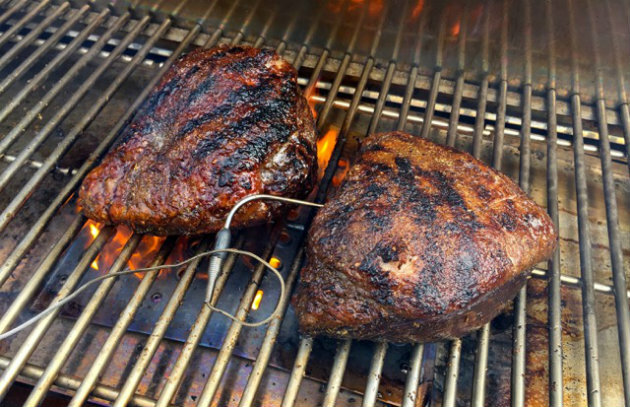 I’ve been reverse searing a lot recently, and here you’ll find a great recipe for a reverse seared tri-tip. The dark crust, the uniformly and perfectly cooked center, the unexpected smoke flavor will make any carnivore’s heart beat faster. But one thing bothers me: Why don’t you find reverse searing in any of the great steak cultures—in Argentina, for example, or in Italy or Spain? And what if the much-touted benefits of reverse searing came at a price? Which brings us to an Italian-inspired grill parlor in Los Angeles called Chi Spacca (“the meat cleaver”). I use the word parlor deliberately because in this world of grandiose steak houses, everything about Chi Spacca is small-scale, from the 33 seats in the intimate dining room to its daily changing, thoughtfully curated menu. 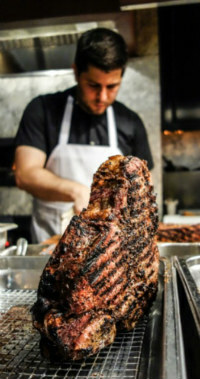 Chef Chad Colby grills some of the largest steaks in North America. His bistecca alla fiorentina (porterhouse) measures 3 inches across and weighs in excess of 3 pounds; his costata (dry-aged, bone-in New York strip) tips the scale at 36 ounces. In contrast to the huge meats, he does all his grilling on a wood-burning grill that measures a modest 36 inches across. Colby’s meats are redolent with wood smoke (from California almond wood), but he uses neither smoker nor smoking gun. They’re also perfectly cooked—no burnt crust or red-blue raw spot in the center. Searing the steak over a screaming hot fire for 3 to 4 minutes per side to crust the surface. Resting the meat off the heat for 6 minutes to let it recover from the shock of the high heat and the aggressive sear of the muscle. Standing the steak upright and cooking it on the low fire side of the grill for about 30 minutes, using the bone to conduct the heat from the bottom of the steak to the center. Resting the steak again—this time on a raised wire rack over a sheet pan, so air circulates freely around it without making the bottom crust soggy. Colby believes that a charred crust with warm rare center shows his beef—prime, organic, 21+ day aged, grass-fed, grain-finished Black Angus—to the best advantage. There are other benefits. All Colby’s steaks are served at chef’s temperature, so customers can’t complain that the meat came more or less well-done than ordered. At Chi Spacca, meats are meant to be shared, so at least some of the diners will likely appreciate their steak that rare. For people who like their beef more well-done, Colby returns the sliced meat to the grill to cook it to the desired temperature. Colby’s steaks come out as perfectly cooked as their reverse seared counterparts, but they possess something the latter lack. For want of a better word, I’d call it vigor. Although a steak comes from a dead animal, it has a living quality to it. The meat tenses when exposed to a hot fire—it sears and contracts the way a live muscle would, reflecting. It has a sort of energy, even violence. If you were to taste a Chi Spacca steak and reverse seared steak side by side, both would have a smoky crust and perfectly and evenly cooked center. The Chi Spacca steak would taste more alive. Reverse searing. Gimmick or godsend? Visit the Barbecue Board and tell us your experiences using the singular technique. Get the recipe for Reverse Seared Tri-Tip.